Iraq: "We Are Making A Difference"
MSF surgeons at work at the General Hospital of Hawijah. 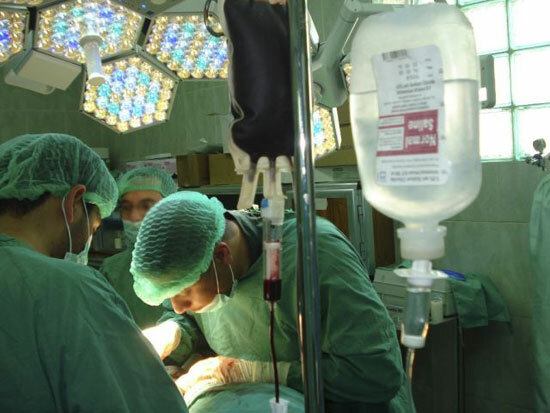 Despite the difficult security situation, an MSF surgical team composed of Iraqi doctors started to work in the General Hospital of Hawijah in Kirkuk governorate at the beginning of January. It is the first time since the outbreak of the war that MSF is able to directly treat patients in this part of the country. The team’s anesthetist Dr. M* discusses the impact of their work. How is MSF providing assistance in Hawijah? We are a small team, a general surgeon and myself. The problem in the General Hospital of Hawijah was that there was not enough medical staff to take care of the incoming emergencies. Generally, the doctors left around one or two in the afternoon. All patients in need of emergency care, all trauma cases that came in after that, had to be referred to Kirkuk city. This is an 80-kilometer [48-mile] trip, and the road is very bad—with about 17 checkpoints to be crossed and lots of military—so it can take hours. It was too long a journey for any patient in a critical condition. There were women with obstetric emergencies taking that trip because the emergency ward at the Hawijah hospital was closed. It was also closed from Friday to Sunday. That meant three days a week without any emergency care for a population of about 450,000, including Hawijah town and the surrounding areas. In those circumstances, what difference can the small MSF team make? Since we took up our work in January, the operating theater is now functioning all day, around-the-clock, instead of mornings only. The result is that we have been able to almost double the number of surgical procedures. Our team alone conducted about 300 surgeries since the start of the program, with over half of them on emergency patients. We mostly see acute appendicitis, Caesarean sections, hernia repair and acute trauma. We are really making a difference with the surgeries we provide. What are the main problems you face in your work in Hawijah hospital? Many of the medical instruments we use are old and maintenance of the material during the past few years has not been up to the standards required. To give you an example, the generator does not work reliably and we are sometimes forced to use manual ventilation for anesthesia. There is also a lack of some specific medicines and supplies and we still do not have any obstetrician working night shifts, or more specialized staff, such as a neurosurgeon. It has been incredibly difficult for MSF to provide direct assistance to the Iraqi population due to the security situation. How is the MSF program perceived by the people of Hawijah? Very well. People are really happy about the round-the-clock functioning of the emergency unit. You can ask anybody here in town, everybody knows about MSF’s involvement in the hospital and people appreciate it a lot. Hawijah has seen terrible violence since 2003, especially in 2006 and 2007. Seeing the hospital improve and MSF provide assistance is giving people a lot of hope. They feel like things are going forward again. Despite the ongoing conflict in Iraq, which has made it difficult for humanitarian organizations to be present in the country, MSF is striving to provide medical care to the Iraqi people. Since 2006, MSF has implemented programs in different parts of Iraq, such as Anbar, Basra and in the Northern governorates of Kirkuk and Ninewa, mostly supporting hospitals by supplying medical materials and training. MSF has also established a program offering reconstructive surgery for Iraqi war wounded in Jordan.